I too have found MDF to not fully hold screws or threaded inserts. But not all wood based products react so. Baltic birch plys,mahagony ply all hold screws and threaded inserts without backing out with time. MDF is truly a poor choice for a loudspeaker cabinets but its priced right very easy to CNC is gental on CNC bits.And you can paint it. This is hard to do with other wood based products used in loudspeaker cabinets. I only use MDF if customer requests paint and I let them know the painted cabinet will not sound as good as natural finish veneered baltic birch ply. And fasters used go through MDF baffle and are bolted. If threaded inserts are losening you can use lock tight or other thread locker in threads. I use this on all threaded inserts, fasteners still can be backed out with ease but wont losen with use. I guess Magico doesn't know how to install threaded inserts. I have a pair of 15 year old speakers made with MDF(veneered and internally dampen with Black Hole 5), the threaded inserts are still tight. All loudspeaker manufacturers deal with the threaded inserts loosening on speakers. If there was ever a cure, trust me, we'd all be using it. Any audiophile worth their salt knows they have to check the tightness of their drivers periodically, most specifically when the speakers are new. Over time, this becomes less of a problem as the wood reaches a sort of 'final' level of compression. However, we are always splitting the difference between tightness of the drivers vs. warping the driver baskets. As stated, if there was a cure -- we'd all be using it. Just so there is no confusion for a general reader, I'm not connected to Magico, nor do I speak for them. I'm just sayin', is all. The things is- WOOD just doesn't work well with metal fasteners period. Any true finely made piece of furniture will have little to NONE metal fasteners at all. Metal is inert, wood, MDF, plywood, all grow and shrink with the seasons. But still- 99% of the speakers out there have MDF or plywood as their cabinets so I can't see this being an endemic problem or you'd see people drivers falling out all the time. One time when I wanted to remove a driver on one of my Epos speakers I almost stripped the hex head it was in so tight- this after a couple years of heavy play. I think it might be worse depending on the environment you might have your speakers in but if you have enough screws in there the problem is minimal. But still- 99% of the speakers out there have MDF or plywood as their cabinets so I can't see this being an endemic problem or you'd see people drivers falling out all the time. Magico's aluminum faceplate may produce better sonic results, but on the issue of fasteners becoming loose, it's is an expensive solution to a problem that doesn't exist. Sometimes, solving a common problem requires one to go for an extreme approach. I, for one, admire Magico's 'stubbornness' to go all out to fix a problem. It may be an expensive solution, but at least they are building speakers that will last. Disclaimer: I am a Magico Mini II owner/user. Once again, there is no worldwide fastener problem. I have a pair of 25 year old $300. speakers, and the drivers are still holding tight. I admire Magico's 'stubbornness' too, they get guys like you to pay $30K for small 2-way speakers. Your speakers are sealed or ported design? I doubt any woofers that can exert the kind of pressure like any of the Magicos will last long if they were fastened to MDF. Wish I could share your optimism. Even with bolts and T-nuts in MDF, these are not fully tightened on too many of the speakers we receive for review. Regarding the use of wood-screws fastened into the MDF alone, this is not uncommon on inexpensive speakers, and for an example with a more expensive design where repeated un-mounting and remounting of the drive-units and terminal panel had caused some of the threads to strip, see my review of the AAD Silver-1, which was otherwise a fine speaker: www.stereophile.com/standloudspeakers/707aad . They're sealed. I did have to replace the woofers when the foam surround died ten years ago, but I've never had to tighten the screws on the new woofers. 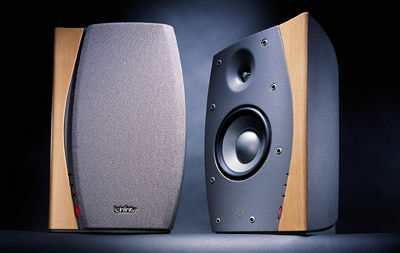 Since you've already bought into Magico's hype, I'm sure you'll doubt any speaker made with MDF will last. If you value experience, then try a pair of Magicos before you slam an owner or portray a cost no object approach as hype. I have tried a pair, and they are frakin good. anyone can design a great speaker-when enough money has been thrown at it. Obviously, Magico has called in their shill. Are you the guy with the $300 25 years old speakers that bother to change the woofers once the foam surround died? You sure you are in the right forum? It is not the Antique Road Show you know? BTW, for MAGICO bashing and trashing party, you can try AV guide. Somewhat old by now but if you must, give it a try. Make sure you do not hear or see the speakers before you do that. It makes the bashing less potent when you actually know what you are talking about. I plan to listen to the V3s the next time I'm on Oahu. Actually, go to the DIYAaudio forum. Do a search for 'Magico'. In the thread you will find me quietly trashing the folks there who have not the slightest clue that they cannot 'replicate' a Magico speaker for a few $k. They don't have the expertise, they don't have the knowledge and they haven't put in the time. Granted, that forum is chock full of highly intelligent and some quite innovative people. They rightly say that some designers cruise the forum to steal ideas. It is also right to say that they themselves steal off anyone they can. However, for personal use, such things are not stealing-even patent law specifically states such, in a flat our fashion..if you can figure it out-that is! The problem is, a interestingly large amount of what goes on that forum inadvertently ends up coming out of the Far East as a cheap product where half the innovation is missing as they don't really understand what is going on. To be fair, there are some incredibly talented designers in the Far East. Lots of Far East perusers of the DIYAudio forum..I guess. With regards to the Magico mini that was the subject of the debate and 'copying', I stated flat out that to do exactly as Magico had done and to produce it as a speaker, would not be an easy task as some were alluding to- and it was the voice of inexperience and foolishness. As for my statement about MDF vs aluminum, it is entirely true. In the hands of the given designer, FOR THE LARGER PART, one is not inherently superior to the other. It is what the given designer does with the items in question that is 'the rub'. I said no more-and no less. There was no trashing going on. Only an attempt to balance the statement about Aluminum being inherently superior. In a perfect world, it might be - under the exact, right, specific circumstances. Ie, when all things are equal. Which they are not. They rightly say that some designers cruise the forum to steal ideas. Which is why that discussion will never take place. Nothing nefarious about such activity, but only a fool discusses what they know and don't know - with other folk who happen to be in the same business areas/fields, or anywhere near those areas. We can have a great discussion about materials, and you might find the conversation quite one sided, with you doing most of the talking. I'll be glad to sit there and have you tell me everything you know, and everything you speculate upon. If you let ego rail and reign for a bit in such a way, I'd be happy sit down, listen attentively, and possibly to come across some gems I've not heard before. It might help me understand something new. Wow, you have just dumb down this conversation to new heights. Sorry I bothered you with such trivial as Physics. Silly me and my ego, I thought these issues were common knowledge. Well, if nothing else, I do hope you learned something. We do need better products out there. Are $25K Speakers normally made of MDF??? For $25K, I expect exotic compounds with 4 or more letter acronyms or rare and endangered african Mahogany... but MDF, seriously??? The Infinity Inremezzo and the Magico have some cool things in common. Both go for the non-parallel side curves, and both use aluminum for the faceplate. The Infinity is aluminum all around, though, and the Magico has a parallel top and bottom, while the Infinity also has a sloping/non-parallel top. This is just one example, but good dieas tend to appear in multiple places.